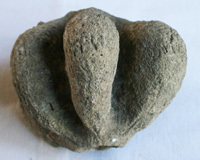 Palaeo Jo's supplies high quality fossils to the collector at reasonable prices. 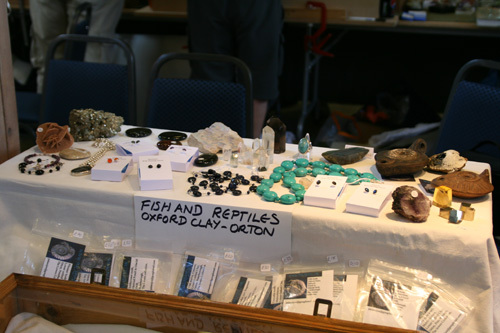 Come and see us at the stall.We have a wide variety of fossils minerals, and antiquities in stock but if you want something we haven't got, we will try to find it for you. Jo designs and makes the jewellery by hand. Although some designs are repeated, they are never quite the same as previous versions, so each piece is quite unique.We have an extensive range of jewellery in stock but are also able to make individual pieces to order. Visit the stall to see the full range. Jo and Pete also do all the preparation work on the fossils, including some restoration where necessary. The whole family like collecting in the field. We have an extensive knowledge of minerals. A wide variety of all of these things can be seen on the stall. 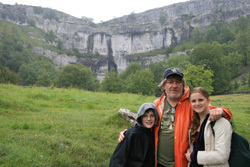 At Malham Cove for a geological excursion.Well it makes a change. 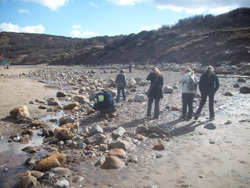 If you bring your fossil finds to the stall we will do our best to tell you what you have. This is a free service. If you are not satisfied with your purchase, return it to us stating your complaint and we will do our best to repair or replace the item to your satisfaction. If we cannot do this we will issue a refund. If the item is damaged in the post it must be kept for proof of damage so that compensation can be claimed from the post office. You can see us at : The Olney Antiques Centre. Cabinet 92. and Area 20. Leyburn Mineral and fossil Fair. 13th-14th August 2016.Sat 10.00-5.00 Sun 10.00-4.00. The Garden Rooms, Tennants, Harmby Road, Leyburn. DL8 5SG. Free entry, free parking, cafe and restaurant. 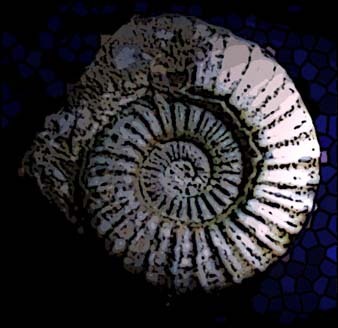 Dorset G A Group, Fossil and Mineral Fair, Allendale Centre, Wimbourne, Saturday 15th August 2015, 10 am-4pm, free admission, with cafe. Local parking but not free. Saturday 2nd September 2017, Saturday 1st September 2018. 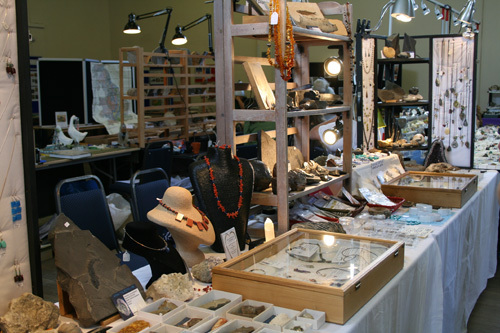 AGS Mineral & Fossil Bazaar. Now the "North London Mineral, Gem and Fossil Show",Saturday 26th November, 2016. 10.am-3.pm. NEW VENUE! Trinity Church, Nether Street, Finchley, London, N12 7NN. Admission £2. Enquiries 020 8883 2500. Olney Antiques and Vintage fair, Church hall, High St. South , Olney, Bucks, MK46 4AA. 10.00am-4.00 pm. Local refreshments and parking. Next show: Saturday 23rd April 2016. 25th June, 10th September, 19th November 2016. Two day Antiques and Collectors fair, The Pavillions, Bournemouth. october 10th-11th 2015. The Kimbolton Country Fayre and Charity Classic. In the Grounds of Kimbolton Castle on the B645 north of St. Neots. Sunday 12th July 2015. A great day out with classic cars a well! Definitely something for all the family. Sharnbrook Upper School Christmas fair. Sharnbrook, Beds. Sunday 1st Dec 2013. 1pm-4pm.We will be in the Main Hall.Denton Day. Saturday 16th July 2011. The village Hall Denton,Northants. Off the A428. Afternoon craft fair and fete etc. Not this year! St Mary's Christmas Fair: Saturday 30th November 2013. Carlton Village Hall. 11am-3pm Oxford Winter Green Fair. Oxford Town Hall. 10.30-4.30. Saturday 7th December 2013. St Mary's Art & Craft Exhibition and Sale.At Carlton Village School. Bedfordshire. Sat 9th 10.00-5.00 and Sun 10th 12.00-4.00 July 2016. Refreshments and free parking. This site is designed by Chris Lowes. Maintained by Jo Lowes.